Born in Owensboro, KY on 17 July 1907, Dudley Morton attended high school in Miami, FL and entered the United States Naval Academy at Annapolis in 1926. Commissioned in 1930, he initially served in Saratoga and Chicago. Having been promoted to Lieutenant (JG), Morton attended Submarine School in 1933. On graduation from Sub School, Morton joined the Asiatic Fleet, serving in the tender Canopus and in S-37. He returned to the U.S. in 1937 for duty at the Philadelphia Navy Yard. In 1939-40 he served as executive officer of the destroyerFairfax, then assumed command of R-5, where he served until April 1942. Now a lieutenant commander, Morton reported to SubRon 4 as a Prospective Commanding Officer. After brief service in the elderly Dolphin, Morton reported aboard Wahoo for a PCO cruise. He replaced Lieutenant Commander Marvin Kennedy as Wahoo‘s commanding officer at the end of 1942. Kennedy’s executive officer, Richard H. O’Kane, retained that position under Morton. In Wahoo, Morton adopted the unusual attack procedure of having his executive officer man the periscope while Morton plotted the attack. It worked well enough that Morton was credited with sinking 19 enemy ships, a total exceeded only by O’Kane, who was Morton’s XO during most of these attacks before leaving Wahoo for his own command. On Wahoo‘s fifth war patrol under Morton, he entered the Sea of Japan. Post war records indicate Morton sank four enemy ships in that area before Wahoo was sunk with all hands on 11 October 1943 in La Pérouse Strait while attempting to exit the Sea of Japan. 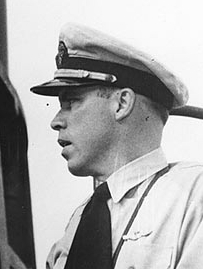 Morton received a posthumous Navy Cross (his fourth) for that patrol.